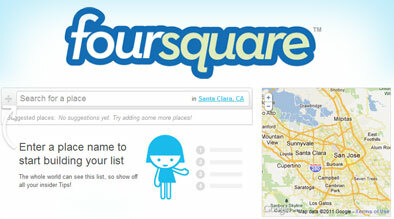 Any business can become actively involved in Foursquare and find potential new customers by creating a Foursquare button. Creating a button is a simple way to stay on the cutting edge of geolocation social media. The buttons allow users to create a ‘to-do list’ of specific locations and tasks on their Foursquare accounts, reminding them to complete things they found of interest when visiting a particular area. 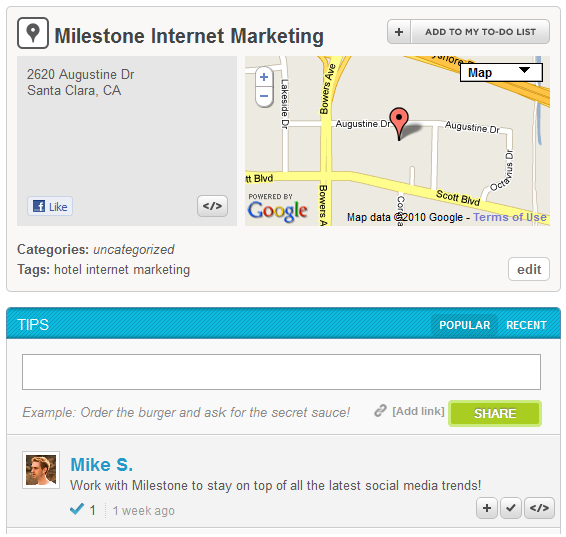 Create a Tip: To create a tip, log on to Foursquare.com and search for the business or hotel. Once the property is found, the business or hotel owner can scroll to the bottom of the page, type in a compelling tip or unique selling point about the property that encourages users to visit the hotel, then publicly share the information by hitting ‘SHARE’. Copy the Code: Once the property has left a compelling tip, the code for the FourSquare button can be generated by clicking on the symbol. The user can then select from several button styles. 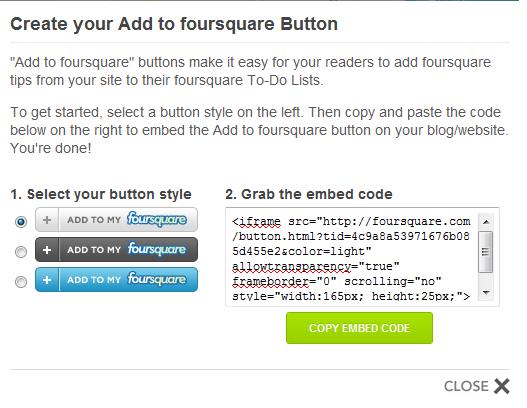 Once a style is selected, the code will appear and the business owner can then click on ‘COPY EMBED CODE’. Embed the Code: once the button code is copied, this can be integrated on the business’s independent website by pasting the copied HTML code on the website or blog. This is most effective when a blogpost is drafted in correlation with the unique FourSquare Tip, which drives traffic to the site with customers looking for that specific information. Benefits of capitalizing the FourSquare button: By clicking the FourSquare button on the hotel’s site, the tip is added to the customer’s Foursquare account. It is added on their “to-do list”, which serves as a constant reminder of something they want to do or places to visit in the future. In the event they end up in the hotel’s market area, Foursquare uses the location programming within the customer’s software (such as an iPhone or Droid phone) to remind them of a saved item on their ‘to-do list’, creating a call-to-action and driving the customer to the business. Simply by making your business or hotel available on Foursquare, and creating compelling tips for your location, you can convert casual browsers and social media junkies into paying customers.